It features vintage silhouettes and whimsical prints. Anyone who grew up watching classic Disney films (which is, to say, everyone) will appreciate this! 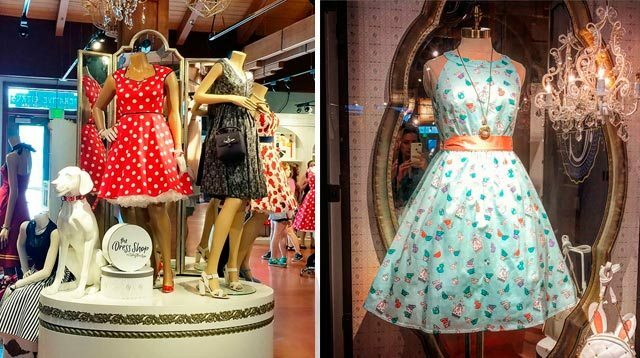 According to Disney Parks Blog, the Happiest Place on Earth just came out with The Dress Shop collection, a stunning line of retro-style dresses printed with patterns that reference iconic Disney elements. According to merchandiser Donna Sorrow, "We designed The Dress Shop collection for guests who want to emulate their favorite Disney characters or theme park attractions in a fun, retro way. These items aren't costumes; rather the collection contains perfect outfits for guests who have a passion for Disney style." The fit and flare designs have a distinctly '50s feel—we can easily envision coordinating your bag and shoes with these, and completing the look with a pair of cat-eye sunnies! We bet you'd have no trouble identifying these prints, but just in case, here's one inspired by Beauty and the Beast. The red polka dot number is, of course, an homage to Minnie Mouse. Blink and you'll miss it—the Snow White dress has dwarves lurking in the apples! There are also tributes to Disney Parks attractions. This one's inspired by the Haunted Mansion! And this captures the magic of the Enchanted Tiki Room. The collection is exclusively available at Marketplace Co-Op in Disney Springs, Florida; and Vault 28 in Downtown Disney District, California. If you're headed there this month, don't miss it!